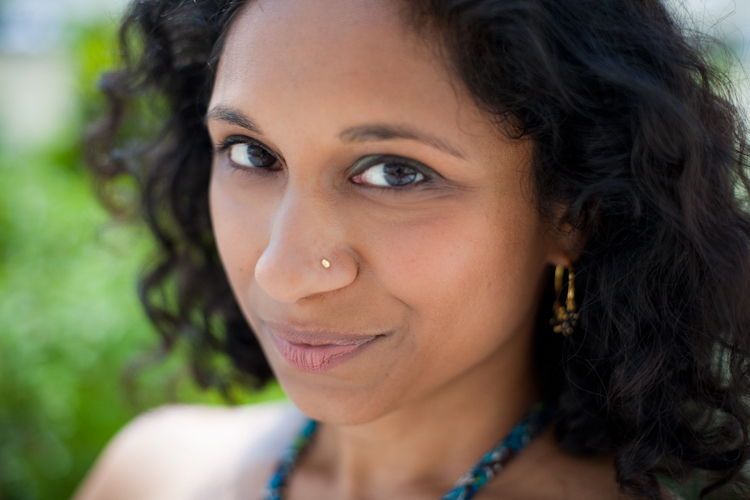 P&W-sponsored poet Gowri Koneswaran is also a singer and lawyer whose parents immigrated to the United States from Sri Lanka. Her advocacy has addressed animal welfare, the environment, and the rights of prisoners and the criminally accused. A Lannan Fellow of the Folger Shakespeare Library  and member of the 2010 DC Southern Fried Slam team, she has performed at Lincoln Center Out of Doors (NYC) , the Kennedy Center’s Millennium Stage , and the Smithsonian Folklife Festival. Gowri’s poetry has appeared in Beltway Poetry Quarterly , Bourgeon , and Lantern Review . She leads poetry and communications workshops and hosts open mics at Busboys and Poets and BloomBars , where she also serves as poetry coordinator. She tweets on-the-spot haiku at twitter.com/gowricurry . One of the things I most enjoy about sharing poetry—through workshops, publication and performance—is the quiet power it has to open us up to diverse experiences and backgrounds. With the assistance of the Readings/Workshops program administered by Poets & Writers,  I’ve twice been given the opportunity to perform my poetry in collaboration with Dakshina/Daniel Phoenix Singh Dance Company . In Sanskrit, “dakshina” means “offering.” Beyond performing both bharata natyam and modern dance, Dakshina/Daniel Phoenix Singh Dance Company offers the community events that celebrate important figures in South Asian history through other art forms. As part of its 7th Annual Fall Festival of Indian Arts that took place in October 2010 in Washington, D.C., the company organized a joint performance to celebrate Mahatma Gandhi’s birthday. I was invited to perform original poetry prior to a musical performance by accomplished sitarist Alif Laila. While we were both familiar with the dance company and founder Daniel Phoenix Singh, we forged a connection as artists through the event and particularly appreciated the ways the other’s work complemented our own. We were both invited to reconvene for a joint performance in May 2011 in celebration of Rabindranath Tagore’s birthday. Tagore is not only a revered Bengali poet but was also the first non-European to win the Nobel Prize in Literature. After each of these performances, I met a number of attendees who were incredibly moved by experiencing poetry in this way for the first time. Some had even jotted down phrases and lines that touched them most deeply. As an artist who views my poetry as one avenue to educate, inspire thought, advocate change, and celebrate diversity, I am especially grateful to P&W's Readings/Workshops program for facilitating my participation in these events. As Tagore wrote, "The highest education is that which does not merely give us information but makes our life in harmony with all existence." By reaching out to audiences who may not typically be exposed to the poet's craft, writers can explore the power of poetry to unite readers and listeners across varied backgrounds and experiences. Photo: Gowri Koneswaran. Photo Credit: Les Talusan. Support for Readings/Workshops events in Washington, D.C., is provided by an endowment established with generous contributions from Poets & Writers Board of Directors  and others. Additional support comes from the Friends of Poets & Writers .